Flowstate is a muscle club and movement studio dedicated to unconventional training. ‘Unconventional’ not only refers to the implements and exercises utilized, but also to the unorthodox philosophy at the foundation of our method. At Flowstate we believe fitness training is a means to an end, not an end in itself. In fact, it is a powerful tool for self-development in all areas of life. You can read descriptions all day, but the best way to better understand our method is to try a Free Introductory session. Humans are social animals, and training is a social experience. 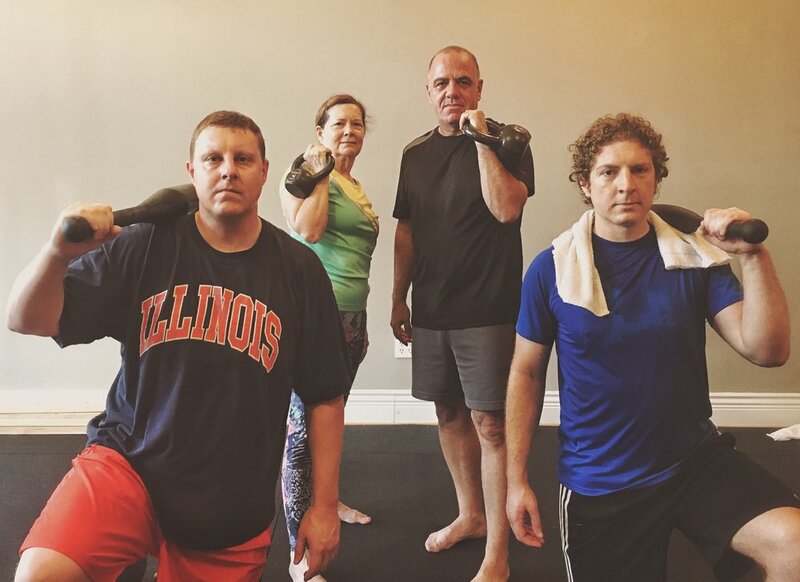 Our small group training is designed to maximize both personal attention and community connection. While Small Group training will fit the needs of most, there are still some who require, or would prefer, an even more individualized experience. The highest aspiration of any coach should be to educate. That’s because good training is more than just getting a 'workout.' Fundamentally, it’s about learning how to listen to your body, and how to move well. At Flowstate you will gain an understanding of the main principles that underlie any successful training program. This allows trainees to develop a unique and sustainable practice in their own lives. Such a practice, one truly embedded into the lifestyle of the individual, is the only viable way to health and longevity. Our programming brings a skill-based approach to exercise. In other words, technique comes first. By practicing the skills of fundamental human movement an increase in work capacity will result as a direct consequence. Conventional training tries to reverse engineer this equation. It pursues work ethic in hopes movement quality will naturally follow. Unfortunately, this is an ineffective strategy, ultimately leading to pain, injury, and burnout. Furthermore, by focusing on movement skills that are neither too easy or too difficult, we can use training as a means to flow (see definition of flow from positive psychology above). At Flowstate we place high value on maintaining balance. Conventional fitness programs incorporate either hard practices (think HIIT or strength training) or soft practices (think yoga or meditation), but few combine them both. Flowstate is the rare exception. Our programming seamlessly integrates both soft and hard techniques. As a member of Flowstate, you will no longer need to spend money or time at multiple places to remain balanced both physically and mentally.